I found myself in a rather large book store. Looking around the store, my eye happened to catch a rather weird sight. 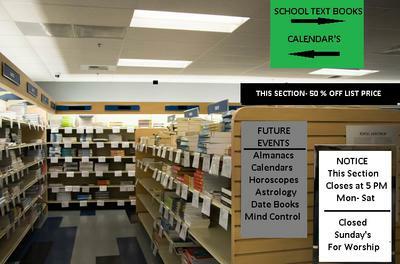 A large grouping of individuals were earnestly browsing through the calendar section of the store. There were people of all ages and dress styles with some obviously of a variety of financial salability. What was so unusual about this picture was that the group of people standing in front of the calendars all had a certain advanced date printed on their shirts. And they seemed to be seriously in search of a calendar whose contents matched the dates on their shirts. Then to add to the mystery of this setting, one of the individuals, who seemed to be the leader of the group, broke from the scene. Walking over to me, he instantly began a conversation as if he had known me forever. What was more mysterious about this one man was that the date inscription on his shirt had no year, only a big question mark. "Sir, who are you, and what's this all about? And what's with the question mark, replacing a particular year on your shirt inscription?" I said, reacting to his presence. "Well, my son, as you probably have noticed, all these people are searching for a certain calendar date matching the date on their shirt, as if to find out about their final date." "But Sir, no one knows that answer, aside from our Creator", I replied. "You are absolutely right, my son. But doesn't the Scripture teach us to number our days, to make our plans wisely?” he came back with a quick response. (Psalm 90:12). Without any hesitation and without wavering, he went right into his sermon mode. "You see, my son, we all should be taught to wisely number our days. We should all be prepared. In other words, we should not just waste time waiting to see what our days will bring. We should prepare for any given situation to happen." "But how can I do that?" I replied. "I don't really have a say in the matter." "Simply by prayer. Pray for your future days. Pray that you will be given the strength to handle the bad, as well as the good days, that are ahead," he replied. "But sir, you obviously know I can't physically determine what will happen," I argued. "What about all those poor people milling over by the calendars?" in a twinkle of an eye, and so did my apparent dream. Or should I say vision? What was so strange, as I sat up in my bed, lying beside me was a calendar, the one I had misplaced. The one with all my important assignments and pending projects. Am I lucky, I thought. However, when I started going through the calendar, all the pages were blank. There was no help in sight; no easily determined, understandable help, that is. So, I shouted in my anger. I just couldn't help but shout it out, wondering what was happening. What am I to do now that I have no plan B for my life? Then, as if by divine direction, I was forced to go to my den bookshelf, in hopes of finding my calendar notes. And lying there on the shelf was Mom's big, old family Bible; the one that went missing at the time she was called home to glory land. "Dear Son, I trust you will find this note before it is too late for you. You thought I was sleeping, all those nights I retired early to bed. However, I was simply talking with your and my heavenly Father, making pleas for your future. So please consider this Scripture for your life. Did I respond to Mom's calling? You bet your glory boots I did, but it was very difficult reading through those big tears. What do you dream? Are your dreams realistic? Do they give you guidance? Professional dream interrupters tell us we all dream something every night, and that some dreams we may remember rather vividly, whereas others we never remember. Yes, I can relate to this statement, been there and done that. So my question is, does your Creator ever give you divine help or instructions for your life through a dream or vision? Being that I am older than dirt, and twice as gritty, I can now assume that I am in the Scriptural dream category. Amen! This above Psalm reminds us that God is more intimately acquainted with our circumstances than we will ever be, and that He is tracking our whereabouts when we can't. Maybe even in our dreams. Amen!